That’s not a question one hears everyday. It’s along the lines of, “Catch the piano!” — a remark so bizarre most normal people would never imagine speaking those words in a single sentence. Certainly I’d never thought to hear that my heroine possessed an extra limb. I’d had a 12×18 of the cover on my desk for months, and I hadn’t noticed anything except that my name was spelled correctly. But my colleague seemed so sure and, worse, so amused, that I rushed to the conference bookstore and checked the cover. Yes. It was true. CASTLES IN THE AIR featured a heroine with one too many appendages. 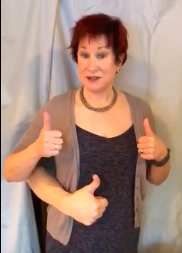 The hero held one of her hands, she leaned on another hand, and the one tucked into her skirts seemed so unnecessary, so superfluous … so much like a great big bonus to my career I could scarcely believe I was that lucky. 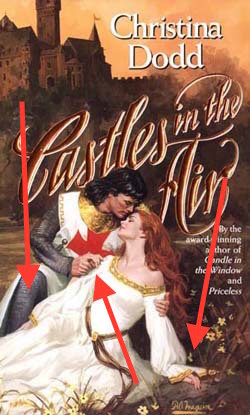 What do you do when your cover artist has a bad day, forgets to erase that extra hand, and no one in the art department spots the mistake before your book goes to press? Mind you, I didn’t immediately realize what a boon I’d received. I tottered over to my editor and told her the good news, and caught a glimpse of the expression that must have been contorting my own face — a cross between deer caught in the headlights and shrieking amusement. Or was that hysteria? 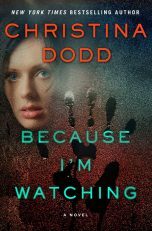 Considering the number of genre titles that are published every year, it’s not that amazing that my three-armed woman made it to publication. What’s amazing is that more paperback covers don’t feature appalling mistakes inside and out. All good things must come to an end, and one day a bookseller told me CASTLES IN THE AIR was gone. I’d sold out the whole print run, one book at a time. First editions are hard to find, but CASTLES IN THE AIR is still in print — with a different cover — and may I point out it’s a great story. In fact, the first line happens to be, “She had all her teeth.” Total serendipity, I promise you. I wrote the novel long before the art department created the cover. I still have people who walk up to me, grinning, to inform me they own a copy (I ended up with only four — where’s the justice in that?) I’ve seen the book packaged in shrink-wrap at a used book store and go for amazing prices on Ebay. The infamous CASTLES IN THE AIR cover will live forever on my website. Please note that my Virtue Falls thriller, BECAUSE I’M WATCHING, features a hand print … but no hand. 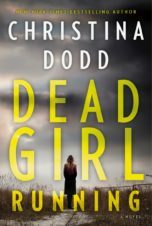 And on my May 2018 thriller, DEAD GIRL RUNNING…she’s not running. Watch the CASTLES IN THE AIR cover mistake video! 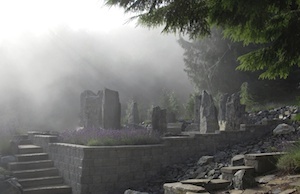 Take a video tour of my office, listen to the bees humming as they work the lavender in the stone circle, and listen while I answer reader questions!